In a small cove on the gorgeous Costa Brava, our two level apartment is located in the charming village of Tamariu. The apartment is composed of a double bedroom, a bedroom with buckbeds, a lightful dining room, a modern open plan kitchen, a private terrace, a balcony, one bath, and in addition, it is a mere three-minute walk from the beach. Tamriu's idyllic sandy beach is lined by a promenade of waterfront restaurants, cafés and shops. Year-round, this quaint village retains of family-friendly and laid-back charm. Come enjoy the peaceful atmosphere of Tamariu in our timeless apartment, ideal for a family with children or a couple. ** For online payments, credit card transaction fee is at guest charge. As return visitors to Tamariu, we looked hard to find the perfect spot for our short stop. The apartment is lovely, better than in the photos and was a great place for us and our nearly three year old. Great finishings, lovely patios and tons of light, the apartment is a short walk into town and to the beach. Everything you'd need for a short vacation and I would recommend it to friends for sure. Thanks for having us and we hope to be back. Thank you for your visit. A pleasure to have had you in our home. will love to see you again and send you the best all the way from Tamariu. Séjour très agréable, environnement calme à proximité de la mer. L'appartement est très propre, fonctionnelle et acceuillant, très près de la charmante baie de Tamariu et avec une très jolie terrasse. .. Nous avons beaucoup apprécié la gentillesse et la confiance des propriétaires. En cas d'un nouveau séjour à Tamariu, nous y retournerons sans aucun doute . Lovely clean & tidy apartment just a few minutes walk away from the beach. Me and my family had vacationed in these appartments. Very quiet, beautiful view from the terrace, fresh air. Everything is wonderful! Probablement un des séjours les plus reussis pour nous! L'appartement est magnifique, très près de la plage, très confortable et bien équipe. Laccueil des propriétaires excellent. Sara, mille mercis pour tous les petits details, nous reviendrons. Nous avons passé une semaine formidable. Les propriétaires sont très attentionnés. L'appartement est très bien situé, très propre, très agréable avec son duplex et sa terrasse. Pas trop de problème de stationnement. Tamariu, petite ville tranquille, est à notre sens l'un des meilleurs pied à terre pour visiter tranquillement la Costa Brava. Bref génial ! (Text automatically translated) Take the AP7 motorway exit 5 (Palafrugell) or 6 (bisbal) Tamariu address. Beautiful small town on the Costa Brava, with many coves to spend lazy days of summer. 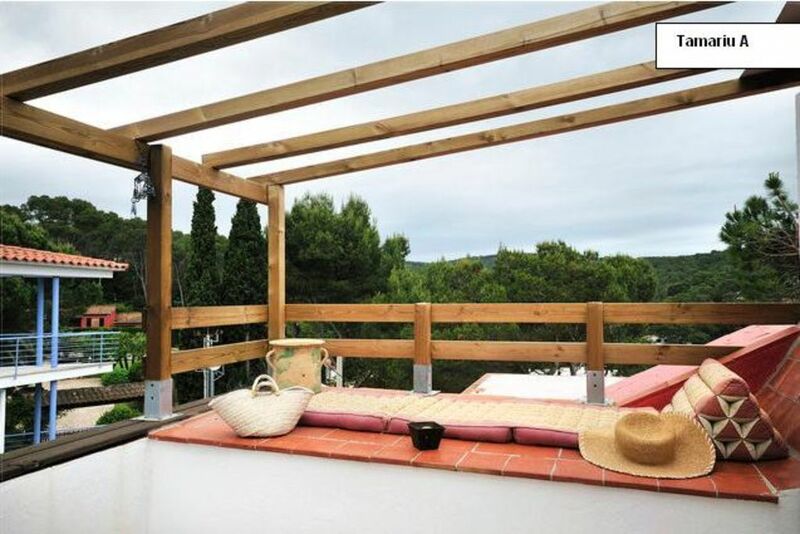 In a small cove on the gorgeous Costa Brava, our two level apartment is located in the charming village of Tamariu. The apartment is composed of a double bedroom, a bedroom with buckbeds, a modern open plan kitchen, a private terrace, one bath, and in addition, it is a mere three-minute walk from the beach. Tamriu's idyllic sandy beach is lined by a promenade of waterfront restaurants, cafés and shops. Year-round, this quaint village retains of family-friendly and laid-back charm. Come enjoy the peaceful atmosphere of Tamariu in our timeless apartment, ideal for a family with children or a couple. Tarifa en función del número de personas (suplemento de 15€ para el tercer y cuarto huésped / por noche) Any charges for payments on line are on behalf of the guest.